How do I download and use the PT Calibration Utility? If you are having picking or dropping problems please check this article first or check with tech support since these problems can sometimes be caused by things other than a miscalibrated unit. This utility requires installation of PTPublisher or installation of Microsoft .Net. framework (22.5 MB). 1. Simply download the utility to your desktop or another location. 3. The first calibration screen will change depending on the product connected. You may hover your mouse over buttons for additional instructions. 4. To get started, place some discs in the input bin. Leave the cover open so you can see what is going on. This utility will allow operation with the cover open. 1. Click "Set and Move To" for the location that is having problems. 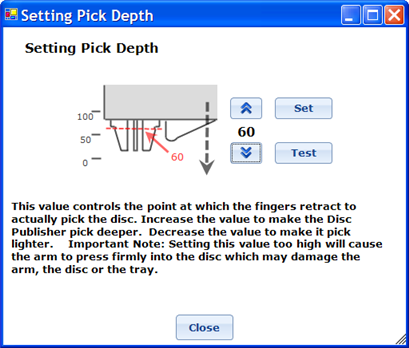 If the input (right) bin is the location with the problem before pressing "Set and Move To" just press a disc onto the picking fingers until it stays in place. 2. The Bravo will pick a disc from the input bin, move over the selected location, move down slightly and hover just above the drop point. 3. 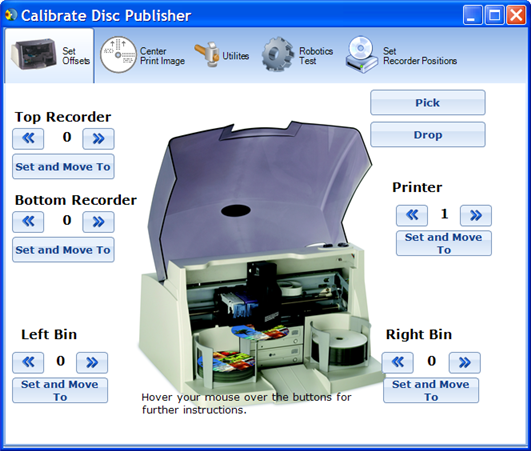 While the disc is hovering look at the disc in relation to the bin or tray. Make sure it is centered over the drop area. If it is not centered, note the location. 4. Use the arrow buttons to move the disc in the direction it needs to go to be centered. The values will change each time you click the arrow button. Try small increments first. Note: Clicking the left button moves the value positively. Clicking the right button moves the value negatively. 5. Once you have adjusted the value, click Set and Move To again to check the position. 6. If it looks good you can try the Pick and Drop buttons a few times to test it out. 1. Click the Utilities Tab - Setting Pick Depth. 2. Adjust the value higher to pick deeper. Move in increments of five or smaller. Setting the value too high may cause the arm to grind into the disc. 3. Setting this value affects all locations. Note: The most common reason to adjust this value is to pick more consistently from a burner drive. Typically all other locations pick fine but the robot has trouble picking from the drive or it drops the disc right after picking from the drive. This happens because over time the recorder drive will flex downward so that it is no longer at the same position it was when the unit was first manufactured. There are many other functions to this utility. For more information on each simply hover your mouse over the button that launches that particular action.